MMS OCTOBER 2018 68 mmsonline.com MICROMACHINING When Jon Baklund ref lects on micromachin- ing, his words demonstrate something almost like awe: "It's like normal physics go out the window, and you're dealing with something in the range of kind of a 'pre-quantum' world. Your cutters will break if you touch them, but then you can machine metal with them. So it's a strange thing, this dynamic between speed and materials." That tinge of wonder colors my discussion with Mr. Baklund about his journey into dedicated micromachining after decades spent on the shop floor working with all kinds of equipment over the years, from learning how to machine on knee mills with his father, to progressive die making and R&D strategies. 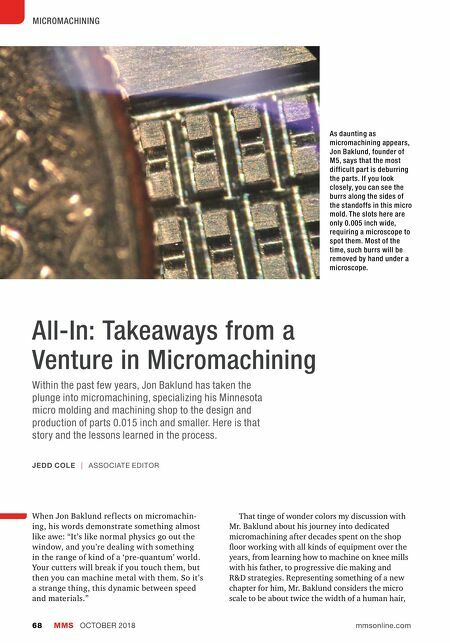 Representing something of a new chapter for him, Mr. Baklund considers the micro scale to be about twice the width of a human hair, All-In: Takeaways from a Venture in Micromachining Within the past few years, Jon Baklund has taken the plunge into micromachining, specializing his Minnesota micro molding and machining shop to the design and production of parts 0.015 inch and smaller. Here is that story and the lessons learned in the process. 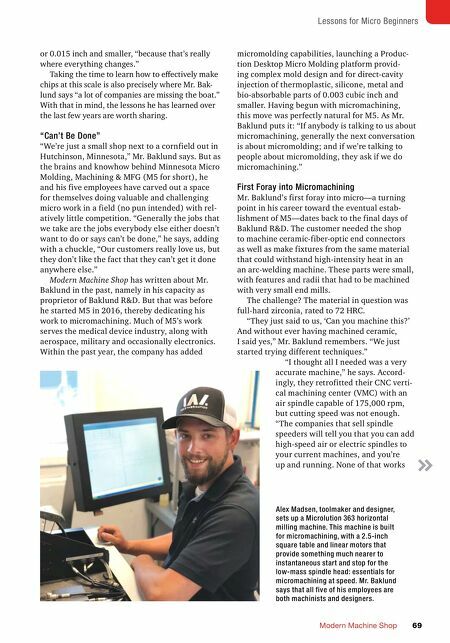 JEDD COLE | ASSOCIATE EDITOR As daunting as micromachining appears, Jon Baklund, founder of M5, says that the most difficult part is deburring the parts. If you look closely, you can see the burrs along the sides of the standoffs in this micro mold. The slots here are only 0.005 inch wide, requiring a microscope to spot them. Most of the time, such burrs will be removed by hand under a microscope.